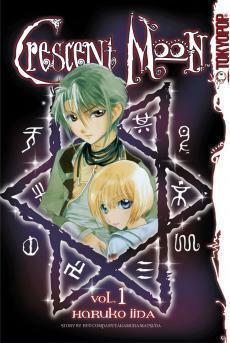 Crescent Moon is a manga began in 2000 with the name, Mikan no Tsuki (An Incomplete Moon). Plot: A young girl is a good luck charm to all those around her, but she herself is the most unlucky person alive. A group from the lunar race ask for her help to find a power source called Teardrops of the Moon that has been stolen from them. The lunar race representatives are a vampire, a werewolf, a kitsune (fox), and a tengu (heavenly dog). The girl enrages the tengu at every turn and though he hates her, you get the feeling they will fall in love. They study a cool book, which shows research pages from an ancient text. The beginning is confusing. The author used a character entrance format that was hard to understand. I didn’t know what was going on until half way through the book. Sometimes the characters had freaky long limbs that did not have anything to do with the supernatural, it was how they were drawn. Where to get it: You can buy Crescent Moon Vol. 1 at Amazon.com . Upcoming: There are 6 volumes in the series, but it did not interest me enough to continue. This was not a bad manga, just not my cup of tea. You can find out all about this manga at the Tokyopop Cresent Moon page. Older PostDo you want text, audio or video?